In this expanded edition of the highly popular original, Jo Stepaniak has retained the book's imaginative concepts and down-home appeal, while broadening many sections to cover a vast wealth of alternatives for every animal-based food under the sun. From homemade veggie "meats" and uncheeses to scrumptious egg and dairy substitutes, Vegan Vittles fills the whole table, and does so simply, tastefully, and creatively. Written in conjunction with staff members of Farm Sanctuary, North America's oldest and largest farmed animal sanctuary and advocacy organization, Vegan Vittles provides valuable and timely information about modern "food animal" production, as well as constructive and effective actions that readers can take on behalf of these animals. The recipes are without pretense, ranging from hearty, home-style American, to ethnic and elegant. 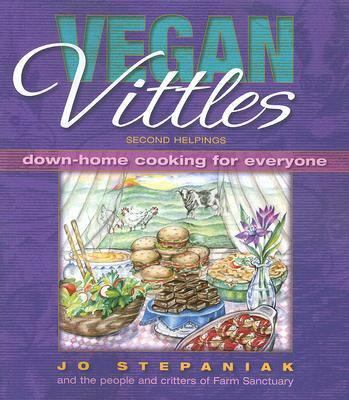 With over 100 exciting new recipes and clear, detailed instructions, Vegan Vittles is sure to inspire compassionate cooks of all ages, regardless of their comfort level in the kitchen.Stepaniak, Joanne is the author of 'Vegan Vittles Second Helpings Down-Home Cooking for Everyone', published 2007 under ISBN 9781570672002 and ISBN 1570672008. Loading marketplace prices 4 copies from $13.91 How does the rental process work?